One of the newest glazing options, UV treated polycarbonate is a rigid plastic which provides much of the clarity of glass but is stronger and more resistant to impact than other glazings. 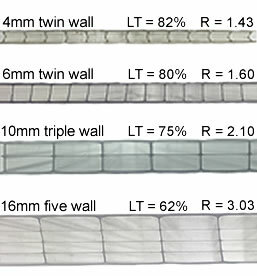 Polycarbonate comes in multiwall panels with many structural walls separating its two or more flat sides (looks similar to cardboard in design when viewed on edge). This structure gives it greater strength and superior heat retention with the insulating air space built into the product. 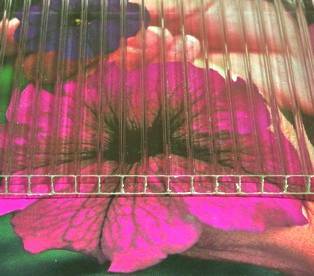 Multiwall polycarbonate also provides your greenhouse with an even diffused light which is optimal for growing plants. Another advantage of polycarbonate is its long lifespan. [A] - The first picture shows light passing through a clear covering. They do not diffuse light well causing sharper darker shadows to appear. This is less optimal for growing plants, but great if you want a clear view of the outside. [B] - The second picture shows light passing through a diffuse covering like multiwall polycarbonate. When light passes through, it scatters causing shade to be "lighter". Plants in the shade receive more total light. This creates better growing conditions for the whole plant.